Lots of changes here at Outside the Line. No I'm not moving to Paris. Or traveling the U.S. pulling a Bambi Airstream behind the Mini. Although I've always wanted a little Bambi as an office. Of course it would be remodeled in Mid-Century modern with an awning, and Tiki lights. Cocktails would be served at 5 pm. Books come from Amazon, not your local bookstore. Music comes from iTunes not a record store. No one buys DVDs anymore. We watch our movies at home on our big TVs. And people seem to want to buy cheap fonts from sites that often do not monitor quality. I know I've bought some. You can't tell. So I have decided to drop my font prices from $29 each to $15 each. This is on my site only. For the time being they will stay at $15 while I try and figure this out. Take a look, I have a large collection. Clink on FONTS in the bar above. Above is a cool DIY idea using a selection of my alphabet and doodles fonts. You do need some skills and equipment to do this. 1. Create your page using my fonts in Illustrator. 2. Add a stroke of .5 to your copy. 3. Make your stroke black. Make your fill white. 4. At this point if you want to move something or make something larger go the Type pull down menu. Select Create outlines. Then go to the Object pull down menu and choose Ungroup. 5. Print several copies and mail them to your niece or grandchild. Everyone likes mail! Finished pages are for personal use only. Here is my latest fabric on Spoonflower. And today I am featured on one of their shop lists! 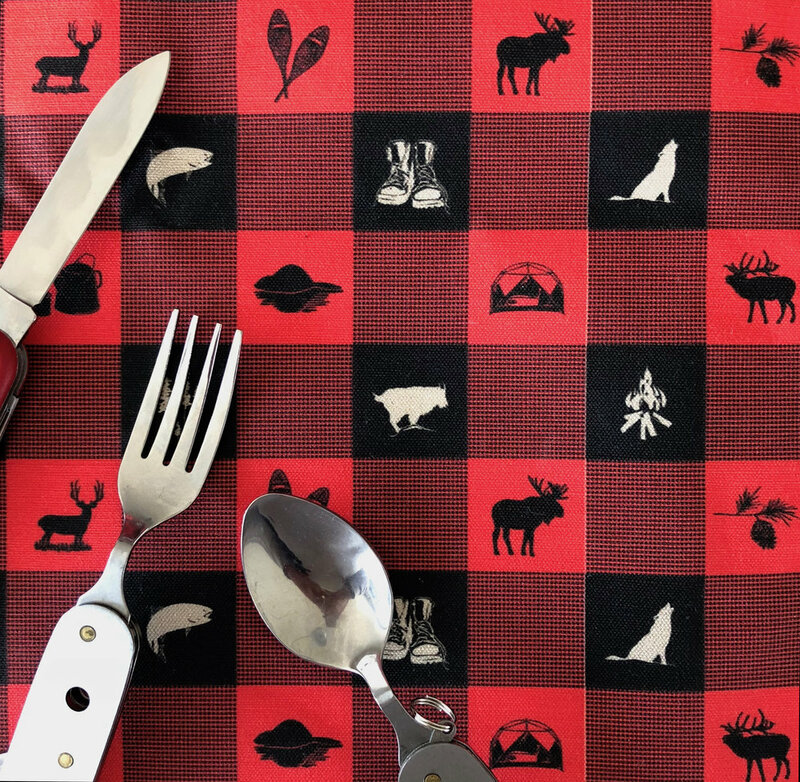 A customer just bought 12 yards of this popular fabric for his cabin in the wilderness. It is perfect for cabins, lake homes, or the man cave. It comes in many types of fabric. Start your Christmas sewing early and make the family matching flannel pjs. This pattern is also offered in wallpaper and wrapping paper. New cards too. You can order a boxed set here, see link to the right. Or visit Hatch Art House. There you can also buy individual cards. And it appears that it might just be Spring today. Go outside and enjoy, I am.